At this year’s annual conference for the Association for Education in Journalism and Mass Communication, Assistant Professor Mark Poepsel was elected Chair of Participatory Journalism Interest Group (PJIG). 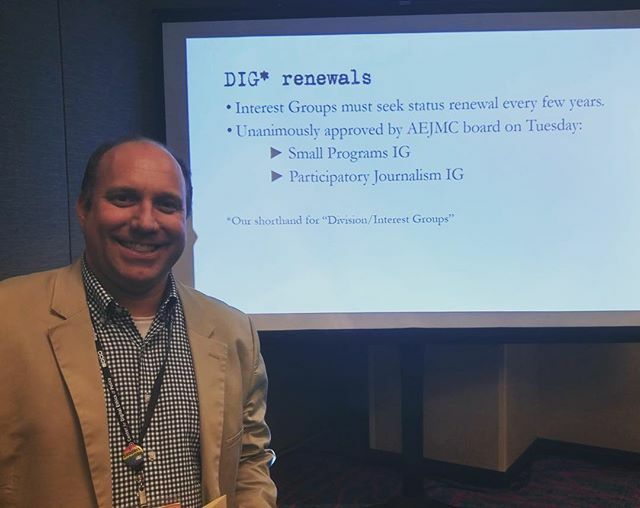 The interest group, one of several in AEJMC, has more than 70 members and has its roots in studying civic journalism-a movement within major news organizations to draw a closer focus on community news rather than sensationalism or the “if it bleeds it leads” ethos. Now the organization accepts research looking at social media in journalism, comments sections on websites, and related topics. Additionally, its scholars often examine a host of issues related to citizen journalism. Dr. Poepsel also appeared on a panel for fellows in the Visiting Professors in Social Media Fellowship program sponsored by the Scripps Howard Foundation. Dr. Mark Poepsel at AEJMC 2017 in Chicago, Ill.
Dr. Suman Mishra, Associate Professor and Director of Graduate Studies in the Mass Communications Department, was also elected to a new position at the 2017 AEJMC Conference in Chicago, Ill. Dr. Mishra is now the Vice Head of the Critical and Cultural Studies Division (CCS). The CCS Division is committed to the study of journalism and media communication from a cultural and critical perspective that encompasses scholars who research history, gender, race, and class in the media. Dr. Mishra also presented her academic research on Identity and the Media; “Who Am I and Who Am I Talking To? Community, Identity and Culture in a Changing Media Environment” and “Blending with Beckham: New Masculinity in Globalizing India” at the annual AEJMC Conference.